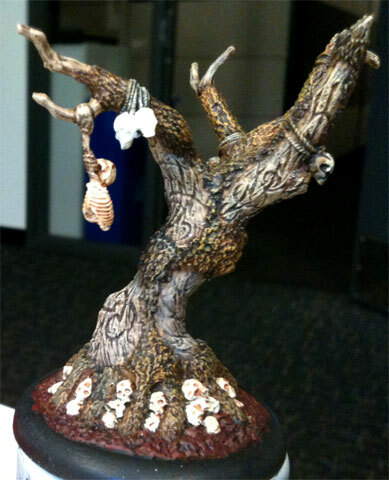 Wurmwood is relatively straightforward to paint, though it has a lot of detail. 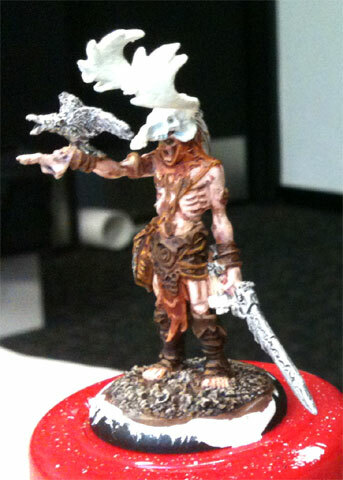 The photo washes out the skulls around the base–the shading is much darker in person, but I will still need to deepen the shadows in the eye sockets. Painting all the ropes was getting fussy and I surrendered partway through the day. I have yet to field Cassius and Wurmwood, but am looking forward to the day I feel advanced enough to take on the challenge. While Circle Orboros doesn’t have anything I’d call as much of a “crutch” or auto-include as the Choir or the Deathjack, The Lord of the Feast comes close, “bloody” close (har!). I specifically started painting him to remove him from my battle bag and try something else with the four points. I’m still having trouble with the skin, drybrushing didn’t work out the way I wanted it to. I need to do a little more glazing and highlighting, the shading ended up too heavy-handed.